Fidelis Journey to Life: True Mercy for the Rhinos? A Way permanently End their suffering? True Mercy for the Rhinos? A Way permanently End their suffering? We live next to a nature reserve and yesterday I saw 3 rhinos grazing next to the fence of the reserve. I wondered how long they will live and when they will be poached like so many others in South Africa. Why with so many charities already existing to "save the rhino" are rhino poaching's rising? Rhino poaching is a horrific thing. They shoot the poor animal and then hack of its horn – sometimes the animal is still alive while its horn is being hacked off. All this is done for money, because the worth of that horn is more than gold. For poachers a rhino is basically an animal with golden horns. The horns are sold to those who believe the horn have great medicinal properties. Let us talk figures. 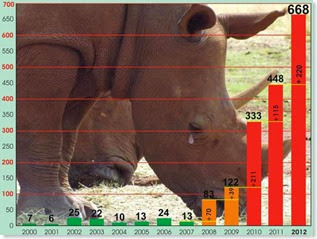 From the year 2000 till 2007 the number of rhino’s poached was under 30 a year. In 2008 the number skyrocketed to 83 which was almost 8 times more than 2007 where only 13 were murdered. Then in 2009 a 122 were killed. In 2010 there were 333 killed. Two years later in 2012 the number doubled to 668 rhinos killed. That is frightening. So what is the solution? Is there one? Currently there are a lot of charities raking in money to “save the rhino”, but the figures shows clearly that whatever these charities are doing it is not actually saving the rhino. In fact – many people and companies are actually profiting from this where you donate money and a small portion actually goes towards “saving the rhino”, but most towards companies and people. In the end what the figures show is that the number will continuously increase until all the rhinos are eventually wiped out. What will we write about the history of the rhino when it’s finally extinct? The rhino was horrifically poached to extinction and suffered greatly based on a belief that it cures cancer and other illnesses. Well done humans. One method to try and “save the Rhino” is to dehorn them. This requires sedating them and carefully cutting of the horn to make it worthless to poachers. This sounds like a good idea, but unfortunately did not work. You cannot completely remove the horn so when you cut it off there is still a small stump left. That small stump is still very valuably and poachers still killed the dehorned rhinos. Some poachers killed the Dehorned Rhinos simply to make it easier for them to find Horned Rhinos. Also, the horn grows back. You have to dehorn the poor animal every year to keep it at minimal length. The costs involved to dehorn one rhinos is estimated to be around US$1,000. To dehorn all the rhinos in the Kruger national park only once will cost US$5.8-8.8 million. And not all the Rhinos survive the dehorning process –there are sometimes veterinary complications while the animal is under anesthetic that may result in death. The more frequently the rhinos are immobilized, the greater the risk. Another method is injecting poison into the horn so that when people digest the horn it will make them sick, but this requires the rhino to be sedated and not all survive this process. It would seem that we humans are at a loss. We do not have any way to “save the rhino”. Every year the number increases no matter what is being done to prevent it. No matter what we do the rhinos suffer. Will we give Mercy to the Rhinos? Is there a way to end their suffering permanently? The only mercy we can give them is to kill them all. Shoot them to save them. Kill them before the poachers get to them – because when the poachers get to them they will be hacked to death and left bleeding. Most will protest a solution like this, because it is not humane or morally the right thing to do. But if being humane is being compassionate we can see that humans are not humane. The compassionate thing to do is to make sure that no Rhino suffers ever again – what then would you do to end their suffering? Christians Have failed Jesus for 2013 years!! !